I’m on my way to the top of Mount Hoven from the town of Loen, in Western Norway, and it takes me only 5 minutes to climb from sea level up to 1000m. 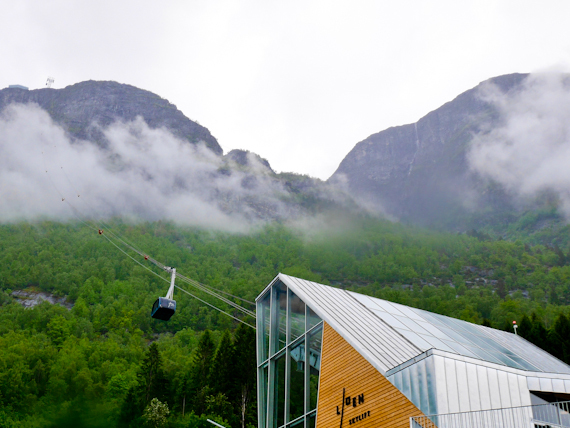 Of course I’m cheating, taking the brand new Loen Skylift, a high tech cable car up the sheer sides of the Nordfjord. 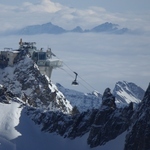 I must admit to feeling slightly giddy as we plunge into the mist, shrouding the sides of the mountain, but I’m soon stepping out into the shiny steel and glass Hoven restaurant. Most people are here for a scenic Sunday lunch, but there’s a network of hiking trails running around the tops. Norwegians really do like to keep fit and around two thirds of them regularly go walking, a number that’s increasing every year. They take it so seriously that at the summit of every hilltop or mountain you can sign a “Fit Book”, and council officials tot up who’s been that month’s most active person. Even the Norwegian equivalent of Kit Kat, “Quick Lunch”, features hiking trails on the inside of its wrappers. 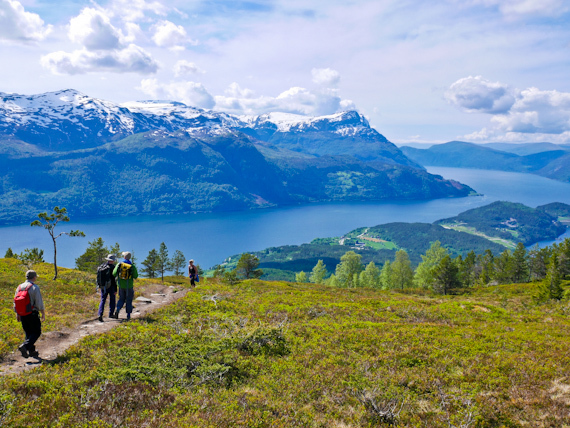 It’s time Brits got in on the act so I’ve joined Headwater’s new Fjords of Norway Guided Walking trip. For eight days I explore the region around Ålesund using a mixture of ferries, long road tunnels and of course my own two feet. Unlike the Skylift, the rest of the holiday is gentler and I adopt a slow and stately pace to the summits. Of course the landscape is chocolate box pretty and I’m particularly intrigued by the turf roofs topping the tiny hobbit houses. Apparently they’re not just cheap, but also heavy, a protection against high winds, and provide excellent insulation from the freezing winter temperatures. Getting around is relatively easy but transfers can be quite long, particularly if you miss one of the ferries. Of course the views as you drive alongside the fjords, or climb the high mountain passes, are simply stunning. The old Geiranger road has gradients of 10%, consists of 29 hairpins and took 300 men, working for 8 years, to complete it in 1889. It’s closed in winter and even in early June, snow ploughs are busy working, keeping the way clear. 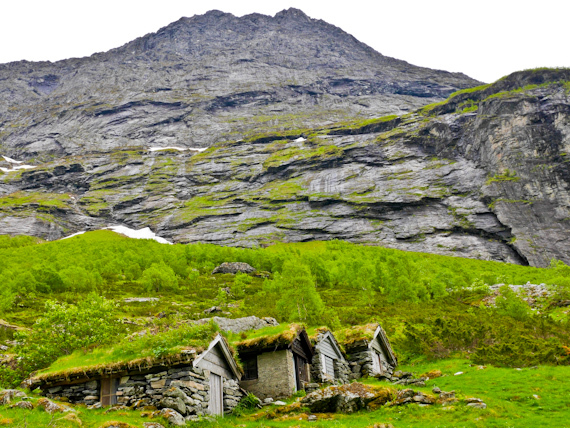 It’s easy to see why the 15 km Geiranger Fjord has been designated by UNESCO as a World Heritage Site. It’s breathtakingly dramatic, its sheer sides rising 1700m upwards and the waters plunging to a depth of 260m. Abandoned farms perch precariously on thin mountain ledges where children were only allowed to play if they were secured by ropes. Spectacular torrents of water tumble over the cliffs and the two waterfalls facing each other are called the Suitor and the Seven Sisters, one trying to woo the other. 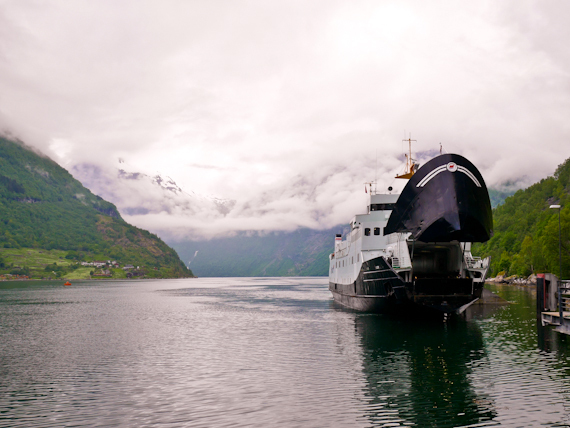 As well as regular ferries, large cruise boats ply this Fjord and the town of Geiranger is full of souvenir shops, slightly too touristy for my taste. I prefer the isolation of Norangsfjord, an arm of Hjørundfjord, which seems untouched by time. At its head is the Hotel Union in Oye, dating from 1891, which has been restored to its former glory and furnished appropriately. 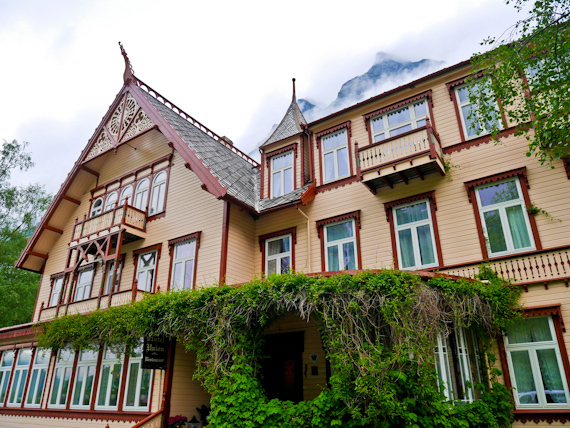 Each room is named after a famous guest, including the German Kaiser Bill, Knut Hamsun, Sir Arthur Conan Doyle, the composer Edvard Grieg, playwright Henrik Ibsen and the explorer Roald Amundsen. Room number 7 is supposedly haunted, the sobbing of a suicidal chambermaid keeping you awake all night, but I hear nothing. 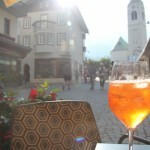 Just down the road is the Urke Kaihus, a bar and café which opens whenever thirsty customers give them a ring. Outdoor tables range the water’s edge and if makes the perfect place to view the surrounding peaks and dream of reaching the summits. The 1564m Slogen is the one to tackle here, but it makes a long day’s hike and I’ve got to catch the ferry back to Ålesund. While I wait at the dock, I’m already planning my return. I’ll spend a week following the mountain trails, enjoy the excellent food at the Hotel Union and maximise my chances of hearing the ghostly sounds of the sobbing chambermaid. 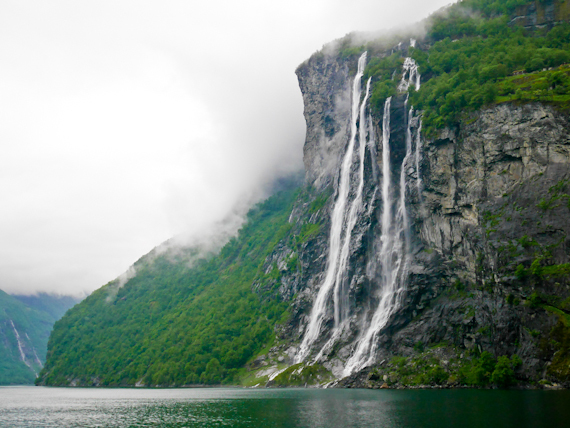 Headwater’s 8 night Fjords of Norway Guided Walking holiday costs from £2,099pp. 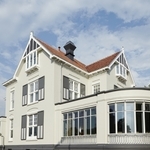 The price includes high quality hotels, with buffet breakfasts, all lunches (2 in local restaurants) and all evening meals, luggage transfers and ground transportation, including ferries. Flights can be arranged from most UK airports to Ålesund Vigra airport, Flight inclusive price (from London Heathrow) is £2349pp. Tel: 01606 828527. Visit Norway has tourist information. KLM flies to Ålesund from Heathrow via Amsterdam.